At the Happo-en there are some sake related event, reservation required. Please check this out! For this year’s Happo-en Cherry-blossom Festival, buffet-style spreads of Japanese, Western, and Chinese foods are offered in especially erected stalls. Of course specialties of Edo (Tokyo)-style sushi and tempura are on offer. Other menu items include plenty of distinctly Edo-style foods featuring local Tokyo vegetables and so-called downtown sweet dumplings (shitamachi dango). To heighten the cherry-viewing mood, on days when the stalls are open, there are performances of dancing called Tokyo Koen-ji Awa Odori and tasting of local Tokyo sake brews. 19:00 – 21:00 (reception counter opens at 18:30). Delight in the flavors of sake produced at the Ishikawa,Tamura, and Ozawa Breweries—the three largest sake makers in Tokyo—served in delightful vessels made of traditional Japanese cut glass—Edo kiriko—from the Taburo Glass Studio, in Edogawa City, Tokyo. You can even try your hand at crafting your very own Edo kiriko cup to drink your sake from. 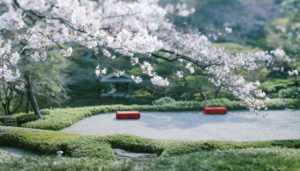 On the day of the event, an original Cherry-viewing Box Lunch, including Japanese, Western, and Chinese treats, will be available to enjoy with either sake or Japanese wine. 19:30 – 21:30 (reception counter opens at 18:30). ¥7,000 (including tax, service charge, a lunch box, and unlimited alcoholic/nonalcoholic beverages). An additional ¥4,320 (tax included) to participate in making Edo kiriko cut glass. A chance for the luxury of full Tokyo-style refinement as represented by soba noodles, vegetables, and local sake. Veteran representatives of the Ishikawa and Toshimaya Breweries explain how sake is made at their companies. Chefs carefully demonstrate on the spot how such foods as hand-cut soba noodles are produced. Exit the station out of Exit 2 and continue walking for about one minute to reach Happo-en. You can find Sake friendly restaurants in Sumida-ku at the Tokyo Skytree Town Solamachi! You can enjoy delicious sake and snacks! ! 1. Purchase ‘Ochoko’ for 300 yen as admission fee. 2. At the sake booth, taste each Sake 200 yen per cup. To enjoy admiring cherry blossoms and drinking Sake is called hanamizake, this year, the Tokyo sakura is expected to be in full bloom between March 24-28, it will be able to do Hanamizake. You can also stop by the Solamachi Shotengai where is packed with tourists shopping for food and souvenirs in a traditional Japanese atmosphere. 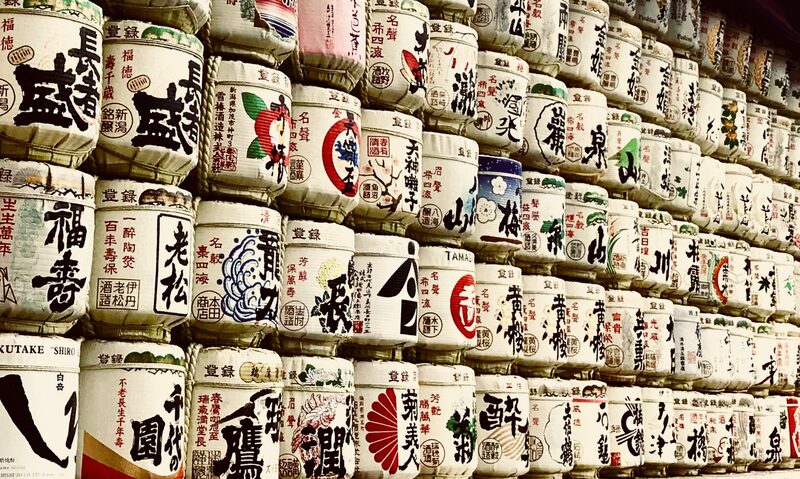 The popular breweries will be opened in the Japanese sake market “Aoyama Sake Flea” from all over Japan, on March 31 (Sat) and April 1 (Sun) in 2018, 2 days, at the United Nations University Farmers’ Market. You can find 120 kinds of Japanese sake selection that as fresh as enjoy only at this time or is difficult to find in Kanto are, from nationwide 36 sake brewers. It is not only comparing the taste of different sake, you can also enjoy taste while listening to the concept of sake and the story behind the development of sake from the brewery. You can purchase Drinking tickets from 2 coin tasting tickets at the venue. Original Ochoko (sake cup) is also a set. If you want to enjoy various tastes of sake, you can buy 30 coins, 40 coins advance tickets. 1 cup of sake is from 1 coin. There are some special sake which is more than 2 coins you need. There is also some food suitable for sake. It is not only Japanese cuisine such as Yakitori (grilled chicken skewers), Gyu-Nikomi(Beef stew in Japanese style), but also western cuisine such as pizza are available. DJ live, Rakugo (traditional Japanese art of storytelling) and more! It is available share with your friend or family! Coins are available during this 2 days! ※ 2% ticketing service fee will be charged.